The technology curriculum supports the archdiocesan “technology integration” goal of creating a technology-rich environment which promotes student-centered learning. A well-designed, secure infrastructure engages students with digital-age applications that are compliant with CIPA (Children’s Internet Protection Act). Students receive the essential instruction they apply in daily academic classes. All students actively participate in lesson assignments which foster the curriculum standards of Keyboarding, Communication and Collaboration, Ethics and Digital Citizenship, Technology Operations and Concepts, Creativity and Innovation, Critical-thinking, Problem-solving, Decision-making, and Research and Information Fluency. Middle school students may join the WSJN News Crew – a student-driven production of our daily morning prayer and news, broadcast live in the Video Lab. Grades K-2 meet weekly for thirty minutes to learn mouse and keyboard fundamentals on the desktop in the local area networked lab. They gain confidence as they create personal files of favorite prayers and stories using Microsoft Word and other appropriate applications. Grades 3-4 enjoy a forty-five-minute weekly class to explore new Microsoft applications in presentations, graphics, and spreadsheets as well as internet resources. They design a portfolio of original works and are introduced to computer programming. Keyboard practice and periodic words per minute challenges ensure typing competency. 1 to 1 Chromebooks are used by each student in Grades 5-8 for daily use in each subject. The weekly Technology class is fifty minutes and centers on the proficient use of the Google Suite of applications, student collaboration, WIFI infrastructure, the cloud environment, personal digital footprint, and applying existing knowledge to generate new ideas and solutions. As students advance each year, technology standards are mastered in preparation for high school. Starting in kindergarten students learn about Hispanic cultures while building vocabulary in another language. By 8th grade, they will have basic conversational skills that will help them in High School classes. Grades K-4 will be graded on participation and classroom activities, grades 5-8 will be graded on participation, classroom activities, proficiency quizzes and tests. Students should practice and study weekly what was taught in class that day and finish anything that was not completed in class. All students participate in large group, individual and small group games and activities. Kindergarten through second-grade students concentrates on movement, spatial awareness, cooperation, and manipulatives. The third through fifth grades add to these with mini lead up units—like basketball, soccer, net games, etc.,. The middle school students participate in team sports’ units including, soccer/speedball, Ultimate Frisbee, Carolina Tag Football, basketball, badminton, deck tennis, pickleball, volleyball, etc.,. All students have a rhythm and dance unit each year. Third through eighth graders get into small groups to choreograph a short routine with movements they have learned during their PE classes. After the routines are ready, we have a fun tradition where students perform their routines for parents who are able to attend. Many times the classes will be able to come and watch the routines of the other grades. Everyone has a great time. Many years, the teachers have come out to perform a ‘surprise’ dance for the students. Assesment criteria for PE are dressing out, participation, effort, improvement, sportsmanship, cooperation, leadership, listening and following directions. No homework is given with the exception of summer and winter Olympic game projects every two years. Each student and their family choose an Olympic project which they display proudly in our school lobby. This is a tradition all the students enjoy looking at to see the unique projects that were done. Students in grades 6th through 8th work on factors relating to mental and emotional health, personal health and physical activity, injury prevention and safety, nutrition and diet, concepts of disease prevention and control as well as consumer and community health. Health is a collaborative class. Other subjects also teach aspects of the Archdiocese of Atlanta Health Curriculum—Science, Guidance, Religion, Computer, Social Studies, Language Arts. Grades for health are based on participation in class discussions, individual, partner and group work, worksheets, quizzes, listening and following directions. The St. John Neumann Music Curriculum celebrates Music as a God-given gift to all people, which enables us to lift our minds and hearts to Him. Liturgical and praise music are incorporated into lessons to support whole-school worship. Classroom instruction includes expressions of music using our whole mind (listening, learning, evaluating), heart (expression), soul (inspiration, creating), body (movement, instrumentation), and voice (words, pitch, inflection). Music class will incorporate active listening, singing, movement to music, participation in rhythmic and melodic instrumentation, and performance. All grades will participate in various school performances throughout the year, including a Grandparents Day program and a Christmas program. Students will enter the process of learning the language of musical notation in a developmental progression. K-1st Grades: Students will participate in activities to develop an understanding of steady beat and dynamics such as loud/soft, high/low tones, fast/slow tempos, and melody, as well as expressions with body rhythm and rhythm instruments. Students will be exposed to opportunities to support melody through handbells and xylophones. 2nd-3rd Grades: Students will participate in activities that extend their understanding of steady beat and dynamics through melodic instruments, such as xylophones and keyboards. Singing and expression through dance and movement will be extended. 4th-5th Grades: Students will continue the use of rhythm and steady beat, adding beginning reading a musical score and applying it to use of musical instruments, such as BoomWhackers and Recorders. 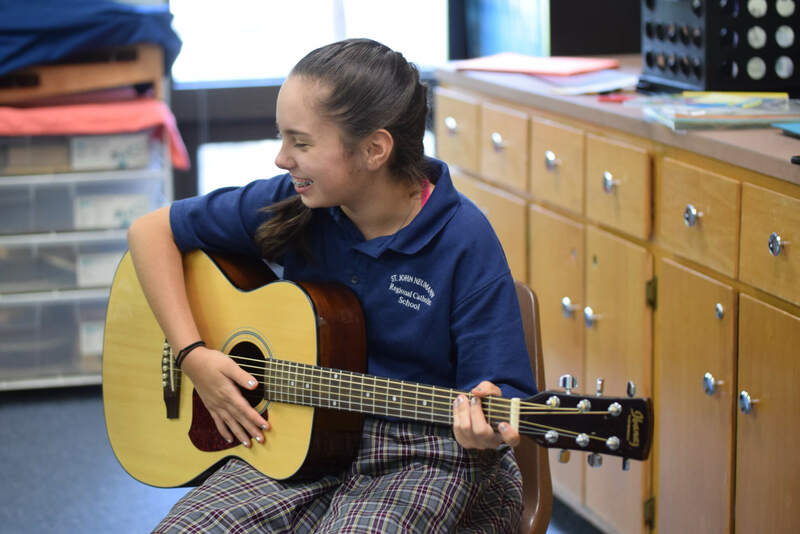 6th, 7th, and 8th Grades: Students will continue their study of music, bringing all elements into performance mode through the learning of sight-reading on the guitar strings and recording their performances on SeeSaw video recordings. Students will learn to create and write the musical score for their own pieces. Students will perform alone and in small groups, keeping to a steady beat. Students will sing and participate in forms of dance. A progress report and report card are issued four times during the year at the middle and end of each quarter respectively to inform parents of their child’s progress. The grading scale for all specials is S—(Satisfactory), NI—(needs improvement), and U –(unsatisfactory) with the exception of middle school Spanish where our standard grading scale is used.